Need a Structure? Traube has you covered! As the premier source for tent rental in North America, Traube Tents and Structures has served as a trusted provider of tent rentals and sales for a variety of industries. A third generation family-owned and operated business, Traube has been serving clients for more than 75 years and has garnered numerous honors for our industry knowledge and exceptional customer service. That’s why nearly 90 percent of our customers have used Traube more than once in the last five years, and more than 80 percent have recommended Traube to others. Clients turn to Traube for our deep experience in consultative job site planning and project management. In fact, our Site Experts have been able to design enclosures for the most challenging landscapes – including an installation on a water shipment barge. With our consultative approach to business, we provide peace of mind that no detail is left unconsidered and work hand-in-hand with each client every step of the way. We can assure that the proper permits are pulled and your insurance provides for adequate protection for the usage of our equipment; details that if overlooked, can potentially lead to costly problems later. We stock a large inventory of only the highest grade products available that have tested under the most rigid of conditions for safety and quality performance. Our inventory consists not only of tents, but also finishing solutions to make your project’s site as complete as possible – including electrical, HVAC, and space decor. Clearspan Tents – Clearspan structures are ideal for the most discriminating client and the biggest events. Clearspan rooms provide an unobstructed view from one end to the other with no pillars or supports – yet can cover several thousand square feet and hold thousands of people. The result is a space that gives project planners the ability to design as simplistic or a compelling of an environment as they wish. 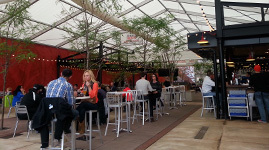 Frame Tents – The most popular style of tent, frame tents allow for flexible design and great value. Frame tents offer an unobstructed view from one end of the room to the other, and can be configured in a variety of ways to match the most challenging space. 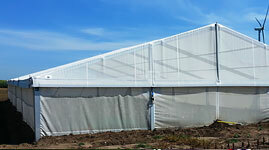 Traube installs frame tents on blacktop or concrete parking lots, decks, pools and tennis courts. Ideal for fitting into tight spots, frame tents can make the difference between guests being cramped or comfortable. Tension Tents – Commonly referred to as pole tents, tension tents provide great value for just about any event. 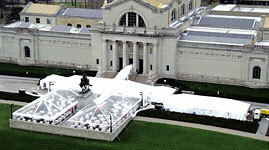 Tension tents can be installed in a variety of environments and are the fastest to install. 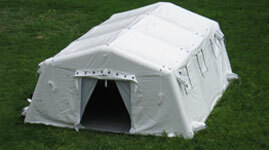 They deliver a large size tent for the most affordable price. How do you know which tent is right for you? The Traube “My Tent Selector” is an all-in-one-tool for planners and organizers looking for the best tent solution for their function. The Tent Selector Tool serves as a personal project planner to help identify the perfect size and style of tent. We also invite you to contact one of our experienced Project Partners, who can help guide you through the process of selection and space planning. 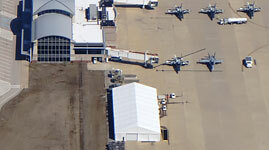 Whether your project calls for scalable business operations, temporary or portable on-site facilities, or requires emergency operational space for disaster recovery and business continuity, Traube can offer immediate solutions that are engineered, prefabricated and all-weather for your permanent and temporary structures. 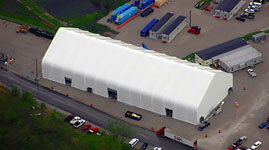 Traube is a leading provider of Rapid Deployment Shelters, Temporary Structures, Semi-Permanent and Permanent Structures, and hard- and soft-walled tents for commercial and industrial applications. With decades of building experience, we provide clients with affordable and practical solutions to manage growth, protect assets, meet tight construction deadlines and operate competitively. Clients turn to Traube for our deep experience in consultative job site planning and project management. In fact, our Site Experts have been able to design structural enclosures for the most challenging landscapes – including remote farming facilities and unforgiving industrial job sites in harsh climates. With our consultative approach to business, we provide peace of mind that no detail is left unconsidered and work hand-in-hand with each client every step of the way. We can assure that the proper permits are pulled and your insurance provides for adequate protection for the usage of our equipment; details that if overlooked, can potentially lead to costly problems later.